Well, it's a little early, but here's one in the spirit of halloween. Enjoy. 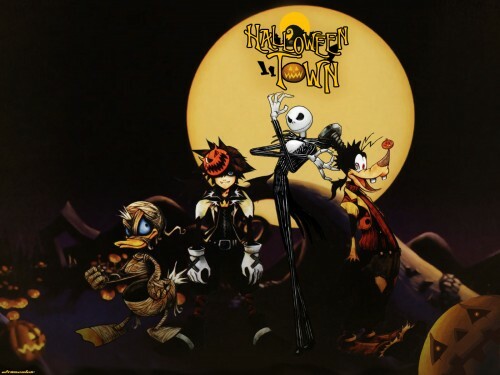 Weird...why is Jack Skellington in Kingdom Hearts? :X Anyways, nice, simple wallpaper. ^_^ I like the harvest moon. Now that's a really cool wall ^_^. I love the theme. Halloween comin right up. woohoo!!!! I love how Daffy is all mummified lookin ^_^. whoo hoo for halloween. that wall paper is awesome. it's definetely a + fav. thanks for making it! Lol! Halloween is almost here! Nice wall! eeeyah! Cool. XD Halloweentown, that was a cool level. I like the darkish feeling here. Bah, wish I had this one around halloween. Ah, very neat-o. :3 The graphics at Halloween Town are some of the best in the game, me thinks. one of My favorite game plus one of my favorite movies! i love you! lol GO nightmare before christmas! and KH! eeeeekkkkk!! I love Jck Skellington! :D XP He's soooo cute!!! With his big ol' eyes!! And his long legs....EEE! awwwww!!!!!! I like this!!!!!!!!!! I love how sora looks when you play this part in the game * riku!!!!!!! I WILL FIND you!!!!!!!!!! * KEEP UP THE great work!!!!!!! yay!!! thanks for this wallie! The halloween toen portion of kigdom hearts was one of my faves! thanks for this nice wallie! *shivers* I always hated the Halloween town part....probably because I didn't like the movie! ^^; I do like the wallpaper, though.